your order in now to guarantee you get one of these amazing light up hoodies! Get your order in now to guarantee you get one of these amazing light up hoodies! These light up hoodies look pretty normal when the EL wire lights are turned off, but as soon as you turn them on WHAM! You turn into an epic party. 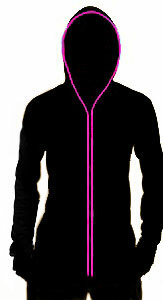 It couldn't be easier with this zipper style EL wire hoodie. There is a small battery pack in the front pocket that will allow you to easily change modes with a click of a button. These hoodies have been designed to be machine washable, instructions can be read below. Washing Instructions: Just unplug the small battery pack and toss the hoodie in with your normal wash. After it has been washed hang it up to air dry. Do not put it in the dryer.